About this time of year we have this debate. It’s a worthy one. Are we better off steering clear of the midpriced player completely? Should we go with the “guns and rookies” strategy and select only the very best gun players and the cheap rookie bargains? Steer clear of your own club. You may have a passionate opinion about your favourite player. Sure Jason Blake may have a bit of extra definition on his bicep this season but is he really gonna step up and be that premium lock I need? You should have a gander at Crouching’s article on Jay To’s winning 2011 Supercoach lineup. You might be surprised at what you’ll find in terms of midprice cattle. Have locked Hargrave into my team as i think anybody who knows anything about the game will. Big McIntosh with cheese is giving me a little headache at the min .. He's doing all the ruck work now but surly Goldstine will be number 1 ruck come the home and away season and he won't be getting 100+ ??? How do you see it playing out ?? oh and on a side note are you put off with Luenbuger's form ?? No worries mate – gotta say that big Hame has got me scratchin my chin as well. In the cold light of day it's likely Goldmember will take the #1 ruck sport at North with Mahe pinchhittinh and going fwd. Would be surprised to see him avg 100. Having said that… bloody cheap though!!! and Bought it in the weekend..
LeuenHamnEggnBurger I'd like to look at more closely for a week or 2 in good conditions. Cheers Jock – that's another beer owe you old boy! Any thoughts on the following mid-priced-ish lads…. Hampson – Will he be key forward in front of good team? hah it's an absolute pleasure Johnno old son. Nick Roo (love the bloke) hasn;t shown me enough yet to suggest he is back in the game. I'll hold off on him but early signs not fantastic..
Jack Roo – not convinced he can rise far enough above his current price bracket to justify picking him..
Morton – pass, enough chances for mine and only had the few touches the other nite. Hampson.. at 350k is value as I reckon he'll appreciate this year.. but at awkward price amongst many better picks in the ruck so a no for now.. Bit of tasty melted cheese on offer there at a mid-price? Yeah – nice chicken wing on the Conc man.. could be a couldron of melted cheese with Conca if what I saw Rd 1 was anything to go by. not he conca old fella – reece palmer. 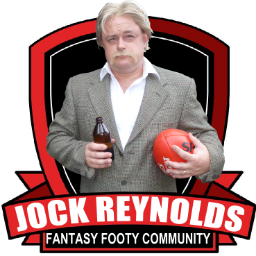 Hey jock, this is my second year in supercoach, been muckin around with my team for a few weeks tryin to sort it out. What do you reckon of Scott Selwood in 2012? No mention of Will Minson. He tore it up on the weekend and should be the dogs number one ruckman this year. I know a lot of people are thinking about him. Thoughts?? Mastens middle name is CLANGER!! Ryan Hargrave or Brian Lake? Any thoughts on Tom Hawkins? He is priced @ $377k – you think he will fire up this year? Watching Sidey with interest. Looks to be the year. Same with Danger. Nice cheat sheet there mate. Thoughts on Malceski.. Could this year be his year? What about Shannon Byrnes form geeeeelong. Sure at 220k a pint? Been thinkingg about him but worries about job security. Kane Cornes looked good in the nab, your thoughts on him or should i stick with Ebert? hey Jock! just wondering who you think i should pick between Hargrave & Lake?